Years ago, Bill’s aunt Marlys always seemed to be in charge of making the gravy at the Thompson Family Thanksgiving dinner. I watched her many times and came up based my recipe on what I could remember from hers. I’m sure she didn’t use “Wondera” for her flour, but I love it! Wondera is a high-quality, bleached, enriched all-purpose flour milled from a select blend of wheats. It is a really fine flour that mixes quickly, so it’s a perfect solution for lump-free gravies and sauces. I’ve heard of Potato Water Gravy referred to as “poor man’s gravy”. I think it tastes awesome and since I don’t like to let anything go to waste, what better way to use the starchy water from your boiled potatoes? It’s also a good solution for those who don’t tolerate milk or cream, like my friend Heather! I prepare this gravy throughout the year and will add additional flavors such as garlic, Worcestershire or balsamic in addition to fresh herbs to add variety to dishes. You can multiply this simply if you’re hosting a large group. While the turkey is roasting, cook your side dish potatoes in a large saucepan. Cook until the potatoes are very tender, 10 to 15 minutes. Drain, reserving some of the water. Immediately after removing meat from a roasting pan or other pan, drain off the drippings, reserving about a half a cup. Cook the minced onion in the butter until transparent. Add the drippings and bouillon seasoning. Sprinkle the Wondra (flour) over the onions drippings and cook while stirring over medium heat for two to three minutes. 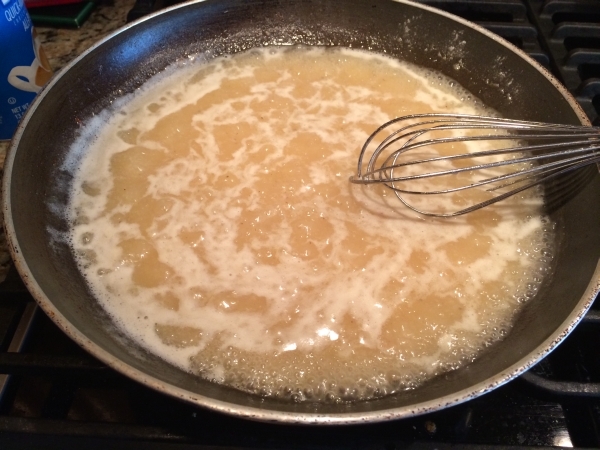 Gradually stir in the potato water, whisking to avoid lumps. Increase the heat to medium-high and cook, stirring constantly, until the gravy thickens, about 10 minutes. If the gravy is too thick, add additional potato water to desired consistency. Taste, and season with salt and pepper. 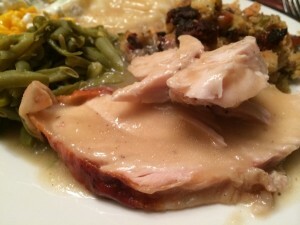 Carve the turkey and serve with the gravy.